We have a 9 a.m. meeting? Yikes! Hold on — let me just click around the internet like a maniac to find something for the morning tweet. Sound familiar? Scrambling for social content is not a new phenomenon. We have meetings. We run late. Things come up. And it’s really hard to get any meaningful amount of work done when you have the next social media update looming over your head every 30, 60, or 90 minutes. It all moves so fast that you might periodically feel a case of the vapors coming on, which is why pre-scheduled social media content should be your new best friend. A few years ago, we created a social media content calendar template to help, which we recently updated to be better, faster, stronger, and just generally prettier. You can fill it in at the same day and time every single week to prep for the following week’s social media content. That means when you burst through the office doors at 9 a.m., you won’t be in panic mode looking for something to push out to your Facebook fans — you already took care of that last week. 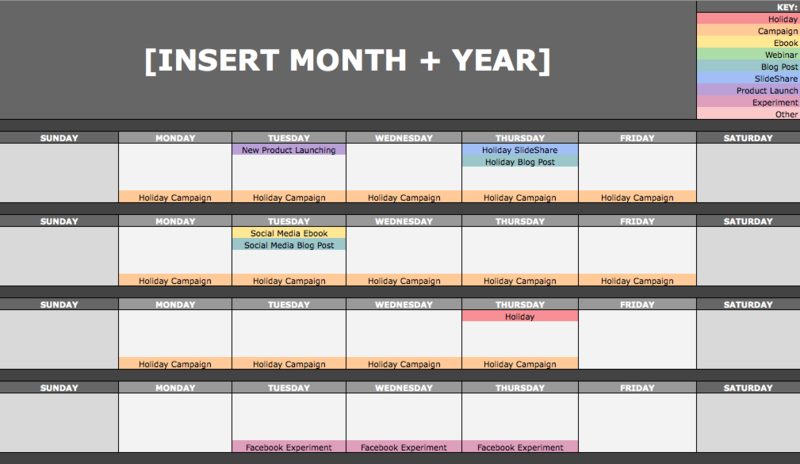 Download the free social media content calendar template here. Then learn how to use it in this post. Whether you use this spreadsheet to plan your content out in advance or upload to a third-party app, you’ll still need to supplement these updates with one the fly content. Breaking news hits? Whip up a quick update to share it with your network. Someone in your network tweets something interesting? Give it a retweet with some commentary. Got a fascinating comment on one of your updates? Respond with a “thank you” for their interaction or an additional follow-up comment. Coming up with and scheduling your social media content in advance is a huge time-saver, but it should go without saying that you still need to monitor and add to your social presence throughout the day. Editor’s Note: This post was originally published in June 2012 and has been updated for accuracy and comprehensiveness.